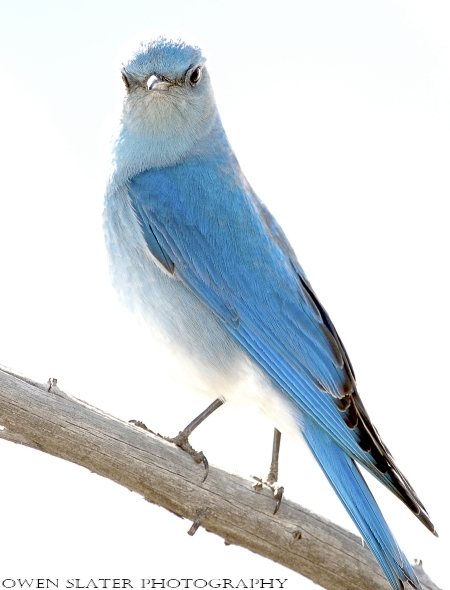 Yellowstone was full of bluebirds. I have only seen parents and offspring together before, but during this trip there were flocks of over 20 birds. This handsome male perched on a branch right next to the road which made it very easy for me. He didn’t seem to be bothered and continued to eye up the landscape for unsuspecting insects. It certainly is blue. Wonder how they came up with the name? The colors are gorgeous and the expression is priceless. He’s seems so different from the Eastern Bluebirds that I see where I live. Hi Mike. Ya, no brown/red on the mountain bluebirds. They always seem to have lots of personality! A beautiful bird, nice capture Owen.